Vegas Casinos Fight to Buy Their Own Electricity. Why Can’t You? There’s a storm brewing in the desert. The big casinos on the Vegas Strip are fighting to buy their own power. Hoteliers including Wynn Resorts Ltd., MGM Resorts International and Las Vegas Sands Corp., which operate more than a dozen massive gambling palaces in Nevada, say they could cut millions of dollars from their electric bills if they could buy power directly from solar farms or power-plant owners. But NV Energy, which is owned by Warren Buffett’s Berkshire Hathaway Inc., is pushing state regulators to make it very expensive for the casinos to stop buying its power, according to documents released by the state’s Public Utilities Commission. NV Energy declined to comment. The same struggle is occurring across the country as large power users watch wholesale energy prices fall while their utility bills rise. New York, Texas and 11 other states allow residents and businesses to buy their electricity from competitive suppliers, but Nevada is among the majority of states that require most customers to buy power from monopoly utilities. Many people in Saint Lucie and Indian River are trapped under the power of a municipal monopoly and not able to buy power from FPL with a nuclear reactor mere miles away. The monopoly privilege prevents consumer choice and the competition that benefits all (but those who can’t compete). The casinos say they would like to use more renewable energy to live up to commitments they have made to shareholders and customers. Many other large companies, includingWal-Mart Stores Inc. and General Motors Co., have joined together to push for better access to renewables but say some utilities are charging too high a premium for it. Casinos say that is part of what is going on in Nevada. After Berkshire bought NV Energy in December 2013, the utility signed long-term contracts to buy solar power for as little as 3.9 cents a kilowatt-hour from First Solar Inc. and SunPower Corp., according to documents NV Energy filed in July with the state regulatory commission. 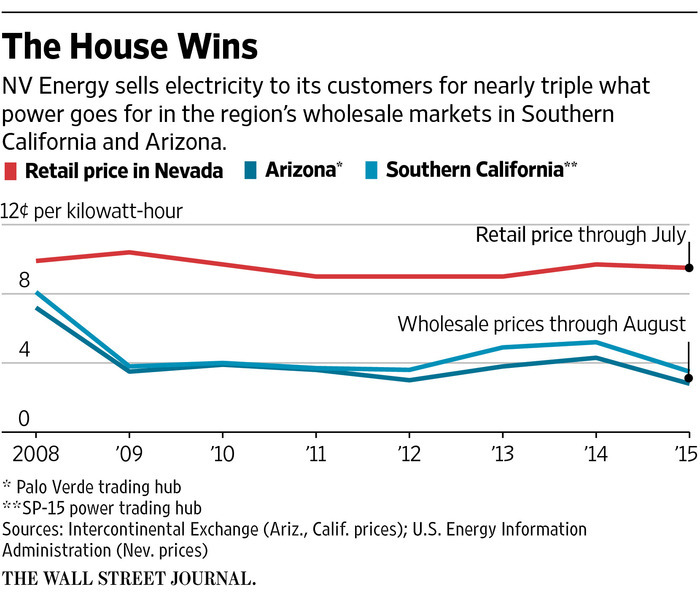 Wholesale conventional power is even cheaper, going for an average of 3.5 cents a kilowatt-hour at a hub in southern California, where Nevada gets some of its power. That is down 34% from 2014, and 57% below 2008 prices, according to data from Intercontinental Exchange Inc.
“They are over-earning and not passing on savings,” he said. Your municipal monopolies are a little different. Unlike NV Energy which keeps the over-charges your local power providers pass those overcharges on. But not to you the consumer. They pass the overcharges to local governments in a taxation without representation scheme. In Florida we have the FMPA cartel that forces their business on you and they have a similar cartel with a stranglehold on people in Nevada. So far, state regulators are taking the utility’s side. 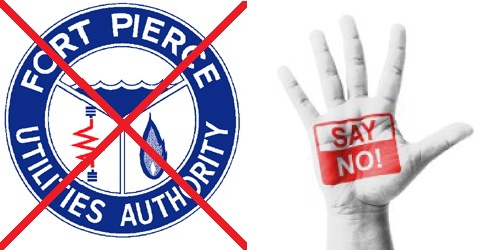 Despite a 2001 law that allows large energy users to switch power suppliers, the Public Utilities Commission of Nevada has never granted customers permission to leave the Las Vegas utility. As one commenter in the story notes there should be no difference in buying landline telephone service and landline power service.